As I mentioned yesterday, I have a few more cool things to show you that I have found recently while out thrifting. Love this adorable doll. Especially her velvet hat with vintage millinery flowers. 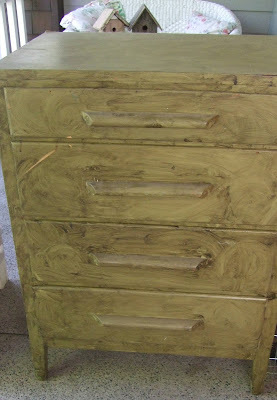 This is the dresser I got for a song from Karen's sale. I know. It's pretty ugly, but it's super sturdy, and well built. A little paint will go a long way here. I found this adorable old pot and holder at an estate sale. I love the curly q's, crazing on the pot and the chippy/rusty goodness of the wire holder. The bottom of the pot says "Royal Copley" which is know is collectible. I think I just may have to keep this little cutie for myself. It would be adorable with a little ivy plant inside. At the same sale I found this gorgeous vintage dress. I thought it might fit me, but unfortunately, not quite. Need to lose about 10 lbs before it would. Love the fabric and design though. 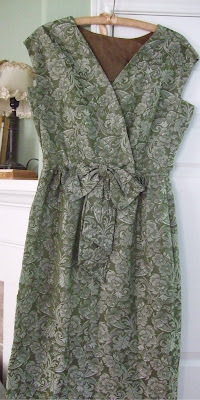 This pretty dress (also found at the same sale) would be perfect for a garden party. Got these slips at that sale too. I am a sucker for vintage slips. I have so many, but I just can't not buy them if they are a good price. And finally, what I got at the Tarte/Willow Nest sale I went to on Saturday with Isabel. 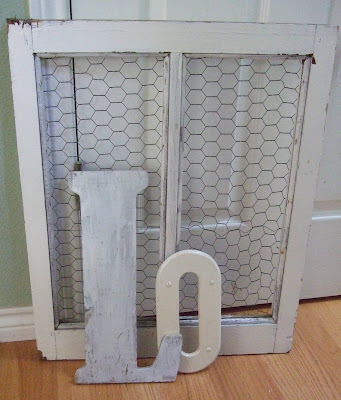 I'm still looking for a "V" and an "E." The chicken wire window will be great for displaying stuff. Thought you might want to see what my darling daughter did to her hair last week, the day before school registration. She will be a sophomore this year (can hardly believe it) and had been telling me for awhile that she wanted to dye her hair blue. She wasn't kidding. It's blue alright. At first I didn't like it at all, but now it's starting to grow on me. I love her sweet little smile in this picture. I'll be back tomorrow with a "White Wednesday" post. mine had hot pink, purple, she's over it now. just back to brunette. Great finds! I wouldn't worry about your daughter. I had pink hair, nose/tongue piercings, 3 tattoos by the time I was 18. And now I am a normal mom with 3 boys. Its just a phase and it will pass. OK... I must say I love her hair. I am a frim believer that if this is what they want I say yay. I know other kids are doing way more crazy things sooo if this is their crazy i say yay... I have a 10th grader and she has her nose with my permission of course... you know it's hard to imagine but they do have their own minds :) I need to own one of those vintage dresses they are waaaayyy to cool and vinatge. I wish a day full of blessings and love. Love all of your vintage finds. The dresses are awesome. Yes, this phase will pass. The piercings are what bother me. They do leave scars after you take out the jewelry. My daughter got a big tattoo of her sons name on her arm. She is 36 now, and I must say it is quite an eyesore. I love all your finds. I know when I find a cool vintage dress I hope it would fit but does not so Frances my dress form gets to wear it so I can still enjoy it. Your daughters blue hair could grow on me too. My girls never did anything like that, but I have a grand daughter that I think would try it. It was good to see you all at Tarte, I have a great photo of you and Isabel and Gayle I will soon post. 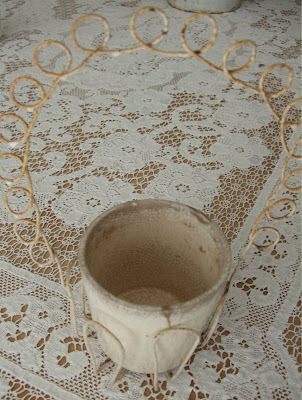 Great post, love the finds, especially the curly pot holder. I like the hair too - awesome that she has confidence to express herself in that way. I love the blue! She looks just like Coraline, Zoe's favorite book/movie right now. 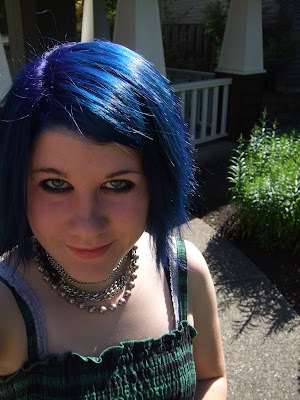 Its a small window of opportunity in your life to want to dye your hair blue, and still look cute when its done. Her next window for blue hair will be a blue-tinted rinse when she's 82! Just a quick stop to say "hello". Can I confess I really like the blue hair? Great things you found thrifting, girl! We are on vacay and thrifted today. Stop by for a look if you can (also have a giveaway going for post #50!) Hugs! I kinda like the blue hair!! My son did that when he was about the same age; but his was temporary. But it was on a mohawk! Your daughter looks cute even with a bit of blue in her hair, it will pass and she will be a very level headed young adult getting this out of her systm right now! Wonderful finds! I love the chicken wire window...and the letters...swooning! Your daughter is adorable, and the blue hair looks great! Oh you found some real great little treasures!! 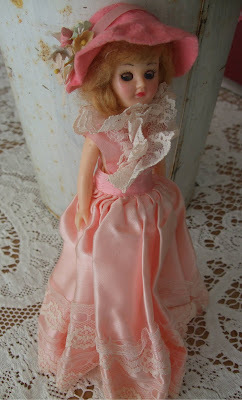 Precious little dollie...is she a Ginny? I have crocheted hats for Ginny that are like the felt and straw hats she wears. My daughter will also be a sophmore and just got her lip pierced! Oh well been through the teen years with my 21 year old. (black hair, piercings, lead singer in a rock band etc.) and he's back to normal! Lots of great finds, Lisa. The slips you found are very nice ones. 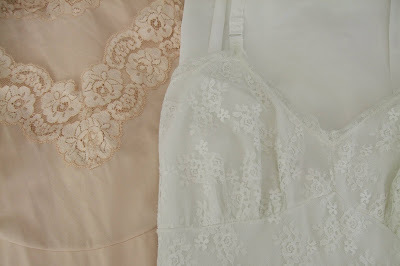 I'm absolutely like you when it comes to vintage slips - I love finding them and can never seem to have enough! Let's do our hair blue!! Somehow I'm thinking that's NOT going to happen! I personally love the hair. I've had purple, red and green hair. I've had my nose pierced (just last year) and I have 7 tattoos. I love it when people express themselves. I think she looks great! Great finds too! Love all of the pearls!